Much of Lisbon’s history has taken place within site of the Tagus River – the return of the caravelles with ships full of Brazilian gold and spices, the departure of the royal court as Napoleon’s armies advanced on the city, the tsunami that swept crumbling buildings into the sea immediately following the 1755 earthquake – and then there was me; overwhelmed and wide eyed as I stared at the river wondering where to start touring this colorful metropolis. I leaned against a stonewall overlooking the river as a Portuguese stick guitar player strummed a melody and tourists took selfies in front of the panoramic view. Contemporary Lisbon was filled with café’s and restaurants with character, a thriving nightlife scene and tempting shopping. Where to begin? Should I go to the Chiado barrio; home to museums, theatres, cafes and elegant shops? Or should I explore medieval Lisbon, housing the iconic Castelo de Sao Jorge and Se Cathedral? As I contemplated my destination, I remembered that I had a guidebook for Lisbon. I don’t normally travel with a guidebook so this was a treat. I pulled out the colorful book from my bag and flipped through its glossy pages. To my surprise, my Marco Polo guidebook had daily itineraries for each district of Lisbon. The “Heart of Medieval Lisbon Perfect Day” itinerary caught my eye. A sucker for history and ancient ruins, I knew that this was quite literally my “perfect day." Plus, it required no planning on my end since it was an hour-by-hour guide on what to do while highlighting the best places to see in the area. The east side of the Baixa area is the oldest part of the city. It is hilly, lined with elegant homes covered with colorful azulejos (Portuguese tile), and has amazing views of the city at every turn. The Castelo de Sao Jorge is perched at the top of the highest hill in the area and is where the city of Lisbon began in 700BC when the Celts built a settlement there. As I explored the castelo, I took solitude on one of the castle walls and pulled out my guidebook to learn about its history. The 1755 earthquake destroyed most of the castle and the structure was restored in the 1930's. Sadly, the structure that is seen today is not very historically accurate. For a moment I was disappointed, then a wild peacock jumped up on the wall next to me – yes, you read that correctly! Today, the castle is both a major tourist destination and home to several beautiful peacock families. After recovering from my shock of the wild peacock "invasion", I managed to take a few photos of the gorgeous birds then I was on my way to see the rest of the castle. Throughout the day, I visited many of the destinations in the guidebook. One of my favorite tips was to visit the Romanesque-Gothic cloister hidden deep within the Se cathedral. In 1147, Moorish Lisbon fell to Afonso Henriques, King of Portugal, who ordered construction of the Christian church on the site of the mosque. At the center of the cloister lies one of the most fascinating sites in Lisbon, archaeological excavations revealing Iron Age buildings that were leveled to build the church. As I followed the walkway, I saw an ancient Roman village; complete with roads, a well, and drainage pipes. Surrounding the Roman village is the cloister’s vaulted roof and pointed arches, each with a unique star at its center. 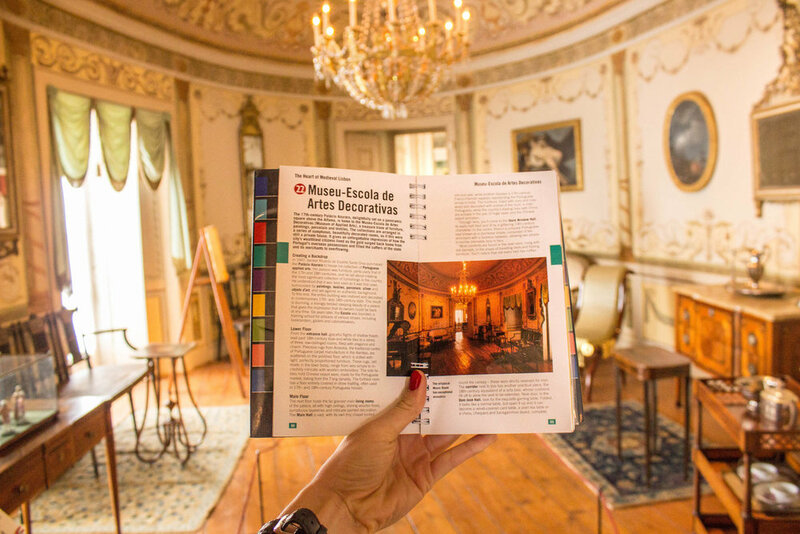 Nearby was the Museu – Escola de Artes Decorativas, once a 17th- century palace and now home to a treasure trove of 17th and 18th century furniture, paintings, porcelain and textiles. From inside of the palace I could hear local street musicians playing the accordion. I felt as if I had stepped back in time. After a quick bite to eat, I headed to the Panteao Nacional with its vast white cupola. The church dates back to 1683 and is home to Portuguese heroes including Henry the Navigator and fadista Amalia Rodrigues. I climbed to the top to get a bird's eye view from the white terrace. In my opinion, this is the best place to see 360 degree view of the city. As I gazed at the colorful buildings surrounding the Panteao Nacional, I was enchanted by Lisbon’s azulejos (tiles) on the elegant homes. I pulled out my guidebook to learn a bit more about them. The word “azulejo” is roughly translated to blue polished stone, which makes sense since most of the tiles have blue patterns. The Museu Nacional do Azulejo (the national tile museum) was nearby and I decided to visit. The museum is located in a former Clarissan convent that has Lisbon’s most magnificent collections of azulejos dating as far back to the 1400s. I paid for my entrance ticket, stepped inside, and was quickly surrounded by tiles of all colors and patterns. One of the most unique parts of the collection was stepping foot into the beautiful azulejo lined courtyards and cloisters. Here I felt as if I was truly in Portugal. Over eight hours, I had seen different parts of Lisbon’s history illuminated. Exploring medieval Lisbon showed me that any city could survive from a natural disaster and rise to new heights. 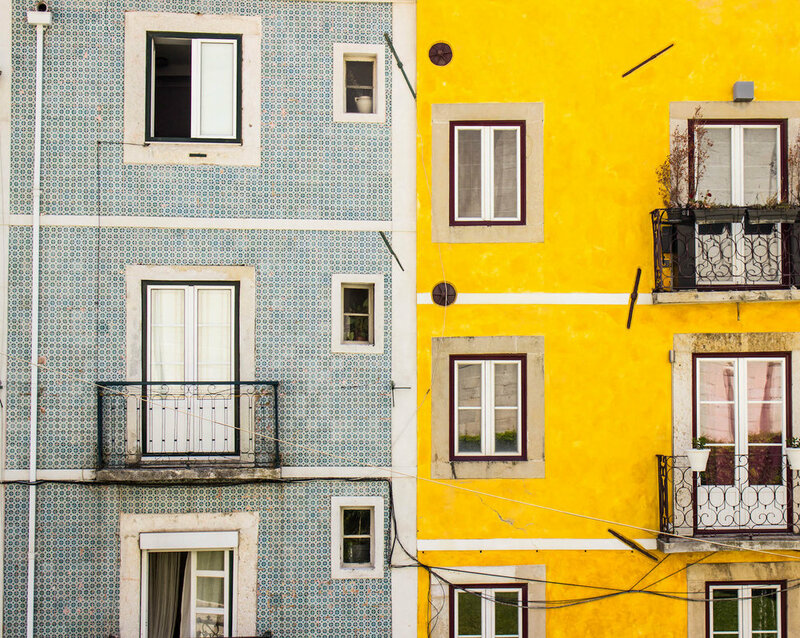 It is a city of contrasts with colorful buildings sitting next to crumbling ruins. The perfect day for any explorer – whether you’re a tour guide or a wide-eyed girl at the Tagus River wondering where to begin. If you're visiting Lisbon, I recommend checking out The Crazy Tourist's article on 25 of the best things to do in Lisbon, Portugal. It is an easy way to prioritize Portugal's most fun activities. Enjoy! This post was sponsored by Marco Polo guidebooks, however, the opinions are my own.